Skin cancer is not limited to a particular age, gender or race – anyone can get it. However, if you have a close relative who has had skin cancer, your odds of getting it go up quite a bit. There are a number of warning signs of skin cancer that you need to look out for. If one of your current moles drastically changes, or if a new mole appears, then you should have it checked by a dermatologist or doctor. Other symptoms include moles or patches of skin that itch, bleed, hurt, or are crusty or oozing. Basal Cell Carcinoma is usually non-life threatening and is the most common types of all skin cancers. This type usually occurs on people who have repeatedly been overexposed to the sun. But, like the other kinds of skin cancers, it can be inherited. Although Basal Cell Carcinomas do not spread beyond the patch of skin that they are on, if you have been diagnosed with one, you have a 60% chance of developing another one in less than years. Like Basal Cell Carcinoma, Squamous Cell Carcinomas are common and rarely life threatening. This type of skin cancer occurs mostly in people who have fair or light complexions. Squamous Cell Carcinomas usually develop from a scaly, crusty patch of skin called an Actinic, or Solar, Keratosis. These seem to be sores or ulcers that won’t heal, and are usually anywhere between a few millimeters and a few centimeters in diameter. While Malignant Melanomas are the least common type of skin cancer, they are the most serious and need to be diagnosed early before they have a chance to spread. Melanomas usually occur in a mole that has been present on the body for a long time, and usually appear on your upper back and lower legs. 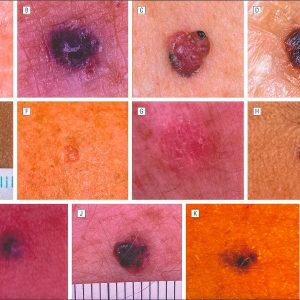 Melanomas are characterized by moles with irregular colors and uneven borders. Suspicious moles are asymmetrical, have irregular borders, are more than one color (shades of blue, red, white brown and black) and are unevenly raised up above your skin. Skin cancer is very curable if it is detected early. Because of this, it is important to have your skin examined at least twice a year by a dermatologist, more often if you have a family history of the disease. There are many different treatment options for skin cancer, and all depend on the type of cancer, the size of it, and where it is on your body. Dermatologists can remove the lesion in several ways, including lasers, scraping, burning, freezing, radiation and excision. The cancerous cells must be completely removed in order for the treatment to be successful.